Submitted Photo SSU Master of Occupational Therapy students, Charisse Blinder, Christen Hopkins, Stephanie Kolodjeiz and Whitley Jo Edge along with their research advisor, Jim McPherson, with their poster presentation at the Ohio Occupational Therapy Association Annual Conference. 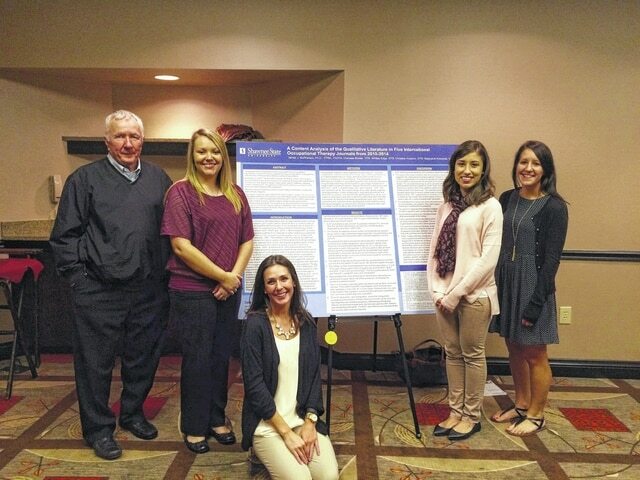 PORSTMOUTH, Ohio – Four Shawnee State University students in the Master’s program for Occupational Therapy (MOT) presented at the Ohio Occupational Therapy Association Annual Conference on Sept. 25 at the Doubletree Hotel in Worthington, Ohio. The poster session contained entries from doctoral programs at Ohio State University, University of Toledo, Chatham University in Pittsburg and the University of Findlay. Jim McPherson, their research advisor, was also present at the conference with the MOT students.